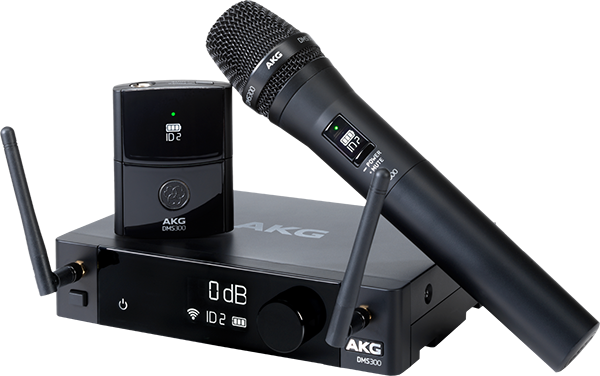 HARMAN Professional Solutions has announced the new AKG DMS100 and DMS300 professional digital wireless systems. AKG DMS digital wireless systems combine 2.4GHz operation with signature AKG sound quality to deliver crisp, studio-quality sound with advanced security features, extended battery life and ease-of-use. The eight-channel DMS300 and four-channel DMS100 are available in two configurations: a high-quality, AKG handheld microphone or an instrument- or headset-ready body pack. DMS digital wireless systems deliver 24-bit/48 kHz uncompressed audio coding, ultra-low latency and signal security provided by AES 256-bit encryption.